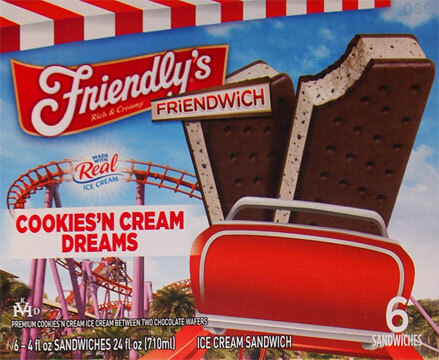 [New for 2013] As part of Friendly's extensive new line up of frozen treats, these ice cream sandwiches have been on my radar for awhile now, they even got mentioned when I talked with Dennis Has A Podcast. Here it is, and while it's hard to see in this photo, the wafers seem darker then usual... this is a good sign. You see, they've added a faint Oreo taste to the wafers, and when mixed with the decent cookies 'n cream ice cream inside, we are bestowed with one tasty sandwich. They could have made these simpler, but they went the extra mile to flavor up the wafers and their work pays off. I like these, I really do. Are Klondike Oreo Cookie Sandwiches better? That's up to you. Klondike has a much stronger Oreo taste, but they can be seen as a little dry. This Friendly's version has just a hint of Oreo, but we're treated with the classic, creamy, ice cream sandwich proportions. Both are good, it just depends what you are in the mood for. Look, ice cream sandwiches are not a complicated thing. They're either classic rectangular wafers or sometimes fancy cookie versions. 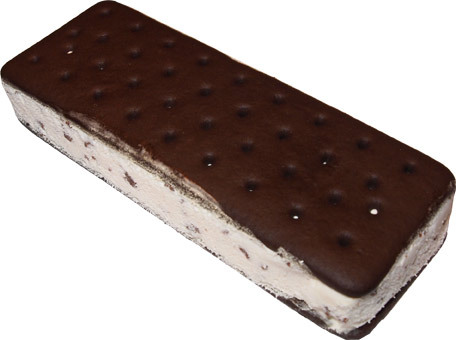 It's an easy thing to make and most companies should be able to make a decent version and I will eat pretty much any ice cream sandwich you put in front of me. That said, again, I have to stress, nice job tweaking this combo. A good flavored sandwich is good for breakfast, snack, or any other time.